General manager and numerous administrative staff shown the door in major restructure. Ford Performance Vehicles is in crisis after sacking general manager Rod Barrett and up to 15 other members of its Campbellfield workforce, throwing into doubt the future of Ford’s tuner of performance cars. It’s the second time in six years the company has sacked top-level management. Former boss Sak Ryopponen and five senior managers - including this reporter, who was communications manager - were shown the door in 2006. Prodrive managing director Bryan Mears will take over Mr Barrett’s role, while other back office functions will be “absorbed internally”. “This has been a very difficult business decision, and one we’ve taken with great regret,” Mears says. “Unfortunately, today’s business realities are that we have to manage our business appropriately and that includes making the FPV business the right size for the market and taking advantage of better synergies with Ford and Prodrive. Mears paid tribute to the job done by Barrett in five years at the head of FPV. “Rod leaves with our gratitude for a job well done and our best wishes for the future, and we will be supporting him in every way we can … as we will everyone affected by this decision,” he says. FPV’s restructure is not expected to affect the operations of Ford Performance Racing, which is also owned by Prodrive. Its driver Will Davison currently leads the V8 Supercars championship. 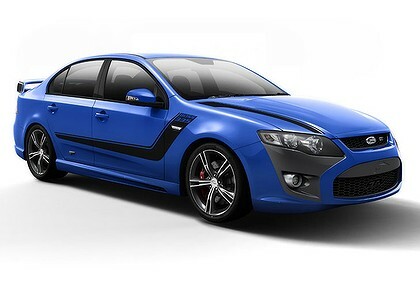 The turmoil at FPV reflects an uncertain future for Ford’s beleaguered Falcon model, which forms the basis for FPV’s model range. It’s believed the locally produced large car will not be built in its current form beyond the current generation, when the Australian operation is likely to have to fall into step with the US company’s global large car program. There is also doubt about the future of the Falcon’s turbocharged inline six-cylinder engine, which FPV uses for several models in its line-up. Last month, former industry minister Kim Carr said he expected the six cylinder to continue until at least 2016, but demand is likely to fall dramatically with the recent introduction of a turbocharged four-cylinder version of the Falcon. The four-cylinder is expected to be the engine of choice for fleet customers, which make up 80 per cent of Falcon buyers. The six-cylinder is also used in Ford’s locally-made Territory SUV, although the introduction of a diesel alternative for that vehicle has dented demand for the petrol unit. I've seen first hand how bad a restructure can get in my old job. The asset manager got turfed and immediately all middle managers were wondering who was next to go. Turns out I was next. Still hasn't stopped my old boss from s**t bricks about his cushy job. I had the pleasure of working under the guise of the former Tickford GM at my previous job. He was a man of great skill & ability & I can honestly say I would gladly work with him again. I'm so keen on seeing what this may be. Hopefully it's the new 2013 5.8L supercharged Mustang engine, retrofitted to our pride and joy. That would make some Holden boys upset... having the world's most powerful production V8 sitting in our Falcon body. Just going off what that hot bittch said. When i had my XR6 and ford released the coyote television ads for FPV, even then i knew it wasnt the most powerful. I dunno how they claim that. But that's a 5.0L, where as this new engine is the 5.8L supercharged. +1 mate, that s**t will be awesome. I'm not convinced that this is the last of it....How much money was invested with Prodrive developing the S/C 5.0L Coyote.? ?...wasn't it something like $40M.?? That's a lot of engines to sell in an economy like this & the population of WA isn't that big. It's a shame, but Australia is a captive market, high cost of living, increasing utility costs, inflated property prices, banks being much wiser about lending money, etc.,. It just doesn't have the population to sustain this sort of direction or spending. The Feds bailed out Ford Aust. similar but smaller scale in fashion to what happened in Detroit; so people will have jobs to feed their families & keep the roofs over their heads, well until 2016 at least. Ford USA had to make changes & Mulally turned it around. FPV projected earnings & forecast sales is just that, those can be readjusted quickly & vaporise just as quickly when market forces dictate. I would love to see a 5.8L FPV emerge but with such an investment in a S/C 5.0L Coyote & too many unknowns it will come with a premium, if at all, I suspect. I'm trying to look at this realistically. Ford Aust. are in a very marginal position. They are responsible to Ford US & even though they have certain liberties being <2% of gross profit, I think they need to become very creative to even survive in such a captive market with very strong competition from Asian manufacturers. Australians are changing the way they think, the Ford/Holden generation is getting old. Governments need to impose stronger duties & luxuries on imports. We're in a global recession (except WA of course) with growth measured in points not digits. Ford Australia need to keep people employed for the local/national economy, for their business, for the nation. Why am I talking about Ford Aust., because FPV is the post production 'performance' partner of Ford Australia. So they somewhat depend on what goes on at Ford Australia; direction, decisions, etc.,. The reality is that FPV is an after thought, a niche market with mostly niche sales. Personally I believe FPV's & Tickford's for that matter have been too tamed a vehicle. It seems that we're 5-10 years behind America & unfortunately if were a little bolder, I think the performance market share would be proportionally larger & that would've likely influenced the family market. You have to win hearts AND minds when selling cars. The economy of scale just isn't 'bringing it' for FPV or Ford Aust. So, I suspect that the Turbo 4 is what we will see, V6's imported from the US after 2016 & of course the V8's (which the yanks have mastered). Unfortunately this will be costing some people their jobs. Maybe even the resurgence of the SHO Taurus & slightly perhaps a post production Mustang since it will share the same chassis as all the former, according to Mulally's Ford One. How many dealerships have lost or decided to give up their FPV selling rights? Somehow I don't see the forecasts becoming reality, otherwise why for the changes? I think this is the first of many changes that we're going to be seeing not just at FPV but definitely at Ford. I don't necessarily like it but I think it's the sustainable business reality. I hope I'm wrong. PS> The 5.8L S/C (based on the modular 5.4L) is the most powerful production today. With 662hp it more than edges out GM's LS9 6.2L S/C that punches 638hp in the ZR1 Corvette. It blows away the younger brother of the LS9, the LSA, which is found in the Cadillac CTS-V & Camaro ZL-1 now rated at 580hp with factory production upgrades over the original 556hp model. It makes Germany's #1 taxi manufacturer (BMW) with the M5's biturbo 4.4L look like a moving embarrassment with 560hp, not to mention all the other German taxi variants. There was a 13-page exclusive write up on the 'Trinity V8' in the "5.0 Mustang & Super Fords" March 2012 publication - a lot of modifications had to made to make the 351 cu.in. work reliably & not cheap ones either. But that's 200 ponies (160kW) over the current FPV with a factory warranty & it's cheaper, but you can stroke the Coyote to 5.3L or make other mods if you forgo lots of cash & your warranty - way behind. Just wondering whether to place my order on the 2013 SVT/Shelby GT500 or wait a year for the 50th anniversary model with upgrades no doubt.